Lockett shad darts are known nationwide for their quality, durability, and 70+ bright color combinations. You have not fished with a real shad dart until you used a Lockett dart. 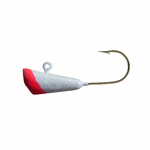 Customers love using these darts for crappie, trout, ice fishing, perch, bass, walleye, etc. The shad darts are one of a kind. Lockett shad darts were first designed by grandfather and founder of Lockett Industries in the 1970’s. He wanted a unique lure that would out do the competition, and did he ever have one. Lockett shad darts have been featured in over 50 magazines and are known and used all around the world. There are companies that can try to imitate this quality product, but there is not one that has come close. All of our shad darts are hand tied and inspected for quality. They go through a unique painting process that include 3 coats of white base, 2 coats of body color, 2 coats of tip color, and then clear coated with our special clear proof that makes these shad darts virtually chip proof. Lockett shad darts can be found in hundreds of tackle shops around the world. “Assortment” color selected for any dart will result in an assortment of colors. Assortment can not be selected for just one location. All jig heads are made with clean lead and Mustad hooks. Painted jigs are made with 3 coats of white base, 2 coats of color, and 2 coats of clear. Our painted jig heads are going to dent before they chip. Compare to other brands, our jigs last longer.